La Coordinadora d’ONGD i altres Moviments Solidaris de Lleida i Humoràlia organitzen la Mostra d’Humor Gràfic “Dones en moviment“. La mostra té per objectiu fer una acció de sensibilització dirigida a la societat per donar a conèixer les desigualtats que produeixen discriminacions i remarcar la importància dels Drets de les Dones recollit en la Convenció sobre l’Eliminació de totes les formes de discriminació contra la Dona (CEDAW). L’art gràfic és un gènere periodístic visual de denúncia i de compromís cívic que pretén contribuir a la reflexió, en aquest cas sobre les causes que provoquen les discriminacions envers les dones. La Coordinadora de ONGD y otros Movimientos Solidarios de Lleida y Humoràlia organizan la Muestra de Humor Gráfico “Mujeres en movimiento”. La muestra tiene por objetivo realizar una acción de sensibilización dirigida a la sociedad para dar a conocer las desigualdades que producen discriminaciones y remarcar la importancia de los Derechos de las Mujeres recogido en la Convención sobre la Eliminación de todas las formas de discriminación contra la Mujer (CEDAW). El arte gráfico es un género periodístico visual de denuncia y de compromiso cívico que pretende contribuir a la reflexión, en este caso sobre las causas que provocan las discriminaciones hacia las mujeres. The Coordinator of No-Governmental Development Organisations and others Solidarity Movements of Lleida and Humoralia organize the Graphic Humor Show “Women in movement “. The purpose of the exhibition is to carry out an awareness-raising action aimed at society in order to publicize the inequalities that produce discriminations and highlight the importance of the Women’s Rights included in the Convention on the Elimination of All Forms of Discrimination against Women (CEDAW). Graphic art is a visual journalistic genre of denunciation and citizen commitment that aims to contribute to reflection, In this case, the causes of gender discriminations against women. 1. Any professional artist or amateur can take part in the exhibition. organization undertakes to send by post mail 2 copies of the printed catalogs to the authors of the selected works. 2. The exhibition topic is Women’s Rights: equality and equity, sexual and reproductive rights, access to education, equal pay, access to the governing bodies, for a life free of violence (sexist violence, sexual slavery, trafficking, etc ...). 3. The Deadline for sending the works finishes on June 25, 2019. 4. The works may be carried out in any technique, with Din A4 format (210 mm x 297 mm) or proportional. 10. A jury made up of qualified specialists in Solidarity and Graphic Humour will make a selection of 50 works among the presented ones. 11. The jury’s decision will be unappealable. 5. 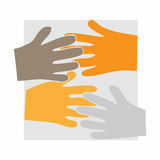 Participants may send a maximum of 3 works, in black and white or in colour, if it is possible without text. In case of including a text, this must be in Catalan, Spanish, English or French. 12. The selected drawings will be part of an itinerant exhibition of Humoràlia and The Coordinator of No-Governmental Development Organisations and others Solidarity Movements of Lleida. 13. The works, as are digitals, will not be returned. 7. In the same e-mail, include a document containing the following information: Title of the work, name and surname(s), pseudonym, postal address, telephone (with the corresponding international prefix), e-mail, a brief CV and a photography or caricature of the author. The organization undertakes to confirm receipt of the work via e-mail. 14. The author’s participation in the contest implies permission for the work to join the works presented and take part in the publication in an exhibition and a virtual gallery. The only aim of that use is to raise awareness between the populations about the causes of gender discrimination against women. The use of the work will have no lucrative purpose. In all media where the work is published, the author’s name will always be indicated. 15. Taking part in the Exhibition implies accepting the entire terms and conditions. The Jury will solve any doubt that can arise. 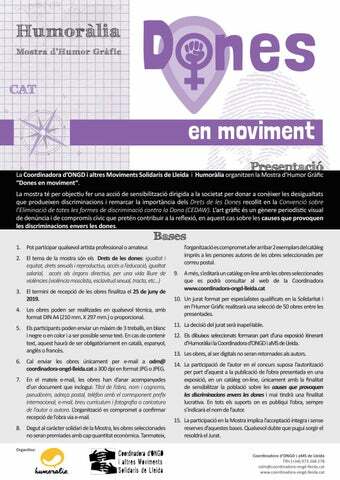 La Coordination des Organisations Non Gouvernementales pour le Développement et autres Mouvements de Solidarité de Lleida et Humoràlia organisent la sélection d’humour graphique “Femmes en mouvement”. L’exposition a pour objectif de mener une action de sensibilisation auprès de la société afin de faire connaître les inégalités génératrices de discrimination et de souligner l’importance des Droits des Femmes énoncés dans la Convention sur l’élimination de toutes les formes de discrimination à l’égard des femmes (CEDAW). L’art graphique est un genre journalistique visuel de dénonciation et d’engagement citoyen qui prétend contribuer à la réflexion sur les causes qui provoquent les discriminations à l’égard des femmes.